Winco LDI-5 Stainless Steel 1-Piece Ladle 5 oz. TigerChef > Smallwares > Kitchen Utensils > Cooking and Serving Ladles >< Stainless Steel Ladles > Winco LDI-5 Stainless Steel 1-Piece Ladle 5 oz. $1.19 Thunder Group SLTL005 Stainless Steel Two Piece Ladle 4 oz. $2.49 Royal ROY L 5 F Stainless Steel Flat Bottom Ladle 5 oz. $1.89 Crestware OPL05 One Piece Stainless Steel Ladle 5 oz. $0.81 Winco LDI-1.5 One-Piece Stainless Steel Ladle 1.5 oz. $0.58 Winco LDI-05SH One-Piece Stainless Steel Ladle with Short Handle 0.5 oz. $0.77 Winco LDI-15SH One-Piece Stainless Steel Ladle with Short Handle 1.5 oz. 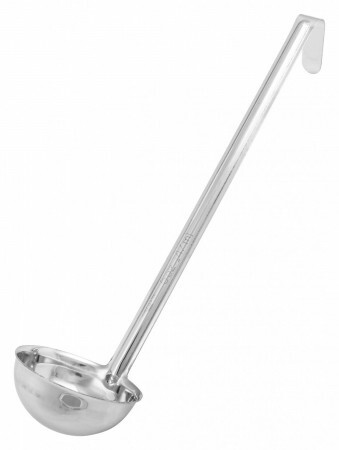 Use the Winco LDI-5 Stainless Steel 1-Piece Ladle 5 oz. for portioning dressings, sauces or dips. Featuring a round, portion-control bowl, this ladle facilitates consistent, drip-free serving while its long handle provides a comfortable grip. Thanks to its heavy duty stainless steel construction, this rust-resistant ladle is easy to clean and will withstand the rigors of a busy kitchen.